Many of the stills here are from what was known as The Golden Age of Hollywood, which began at the end of the silents in the late 1920’s and lasted through the 1960’s, when the popularity of movies soared. Some of the movies in the stills are well-known, some are from lesser-known films. Stills used to be available to buy at the used bookstores in Hollywood, now they can be found at ebay. 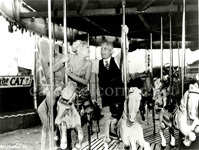 Herschell and Parkers carousels are often seen as portables were plentiful for rental from the many kiddielands that then dotted the Los Angeles where the major motion picture studios were located. One movie that deserves mention is Strangers on a Train, Alfred Hitchcock’s masterpiece. 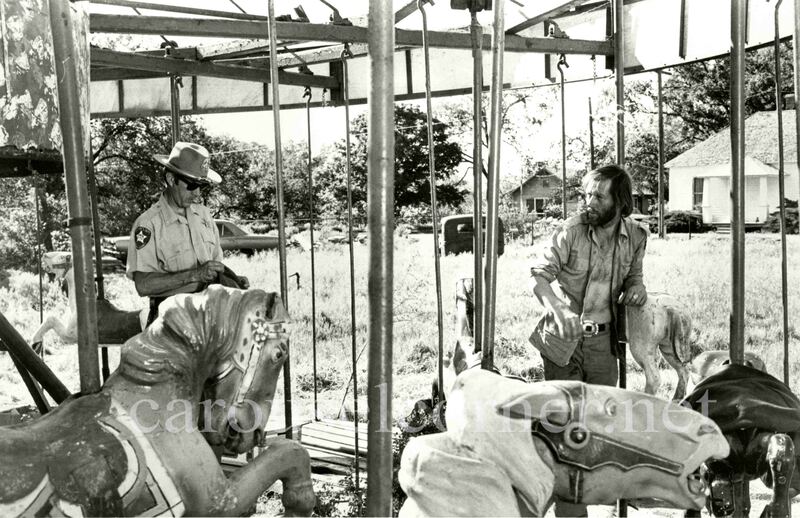 The amusement park scenes were filmed at a private ranch in the San Fernando Valley. 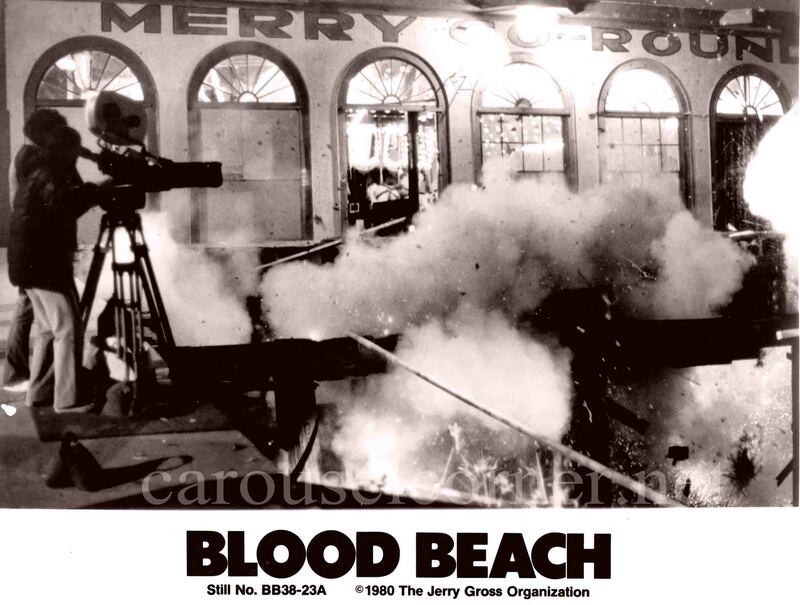 The Herschell carousel was a rental. 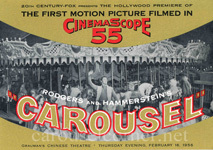 In the close-up scenes of the carousel, some horses from the nearby Griffith Park carousel are visible. 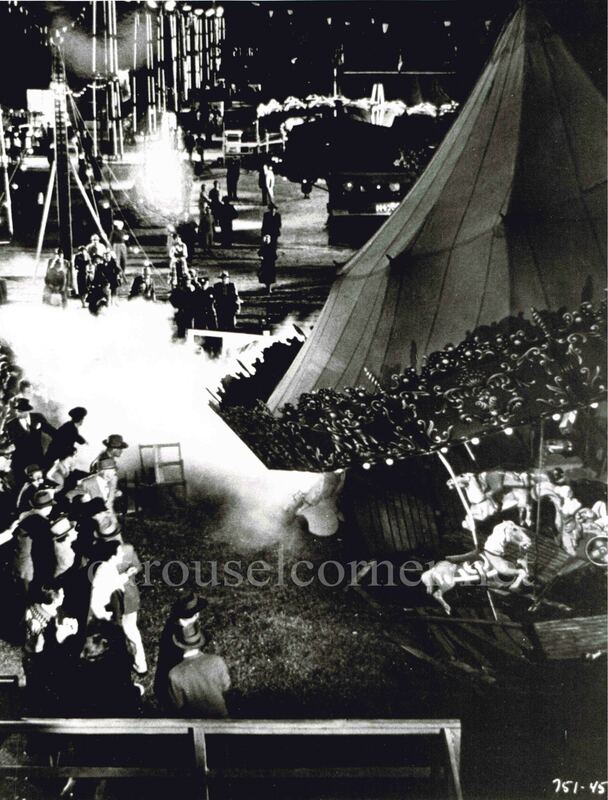 The carousel crash scene was done with a combination of blue-screen special effects and miniatures. 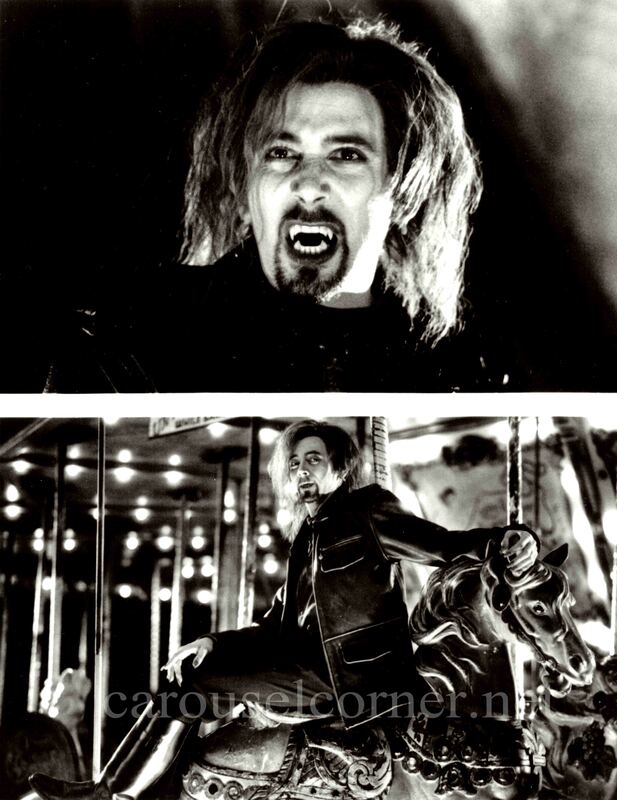 In the scene where the old carny crawls under the runaway carousel in an attempt to stop it – that was real. Hitchcock said he would never do anything like that again. 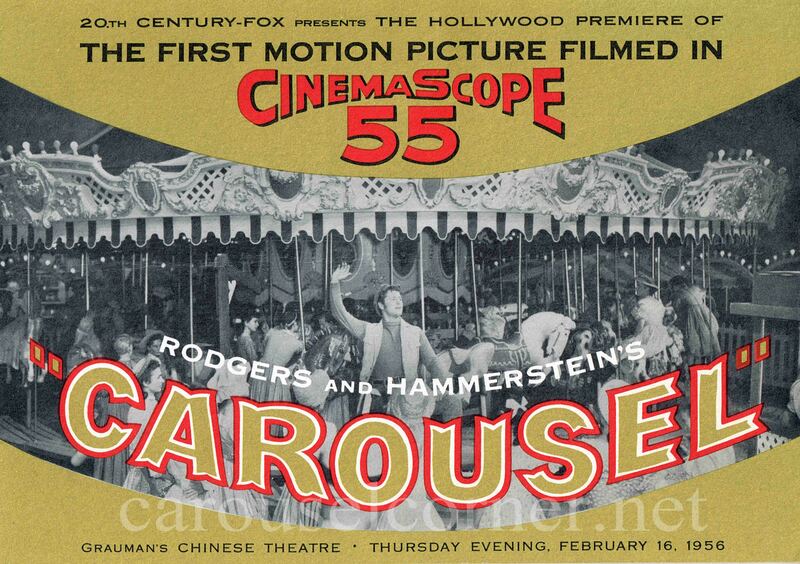 If you haven’t seen this captivating movie, you haven’t seen the greatest carousel movie scene ever! Stills from B. Williams collection. 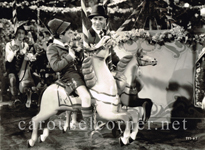 1933 – Fish Hookey - Family, Comedy, Short - starring The Little Rascals. 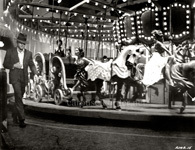 Truant kids go to an amusement park (the Venice, CA pier) where they are chased by the truant officer. 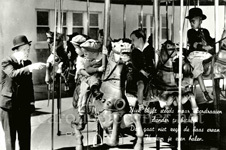 The Little Rascals on the Parker that later went to the Santa Monica Pier and Beverly Park. 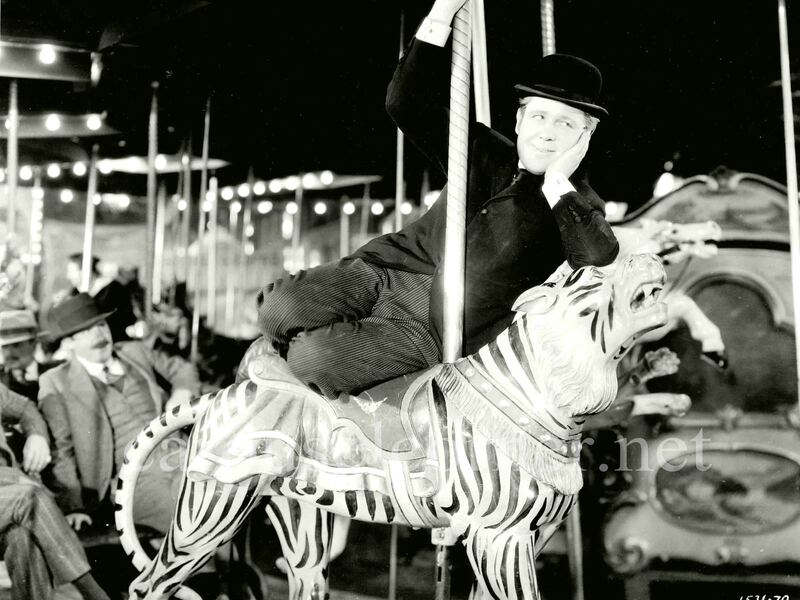 1935 – Ruggles of Red Gap - Comedy, Romance - starring Charles Laughton, Mary Boland, ZaSu Pitts. An English valet (Loughton) assimilates into life in the the USA. 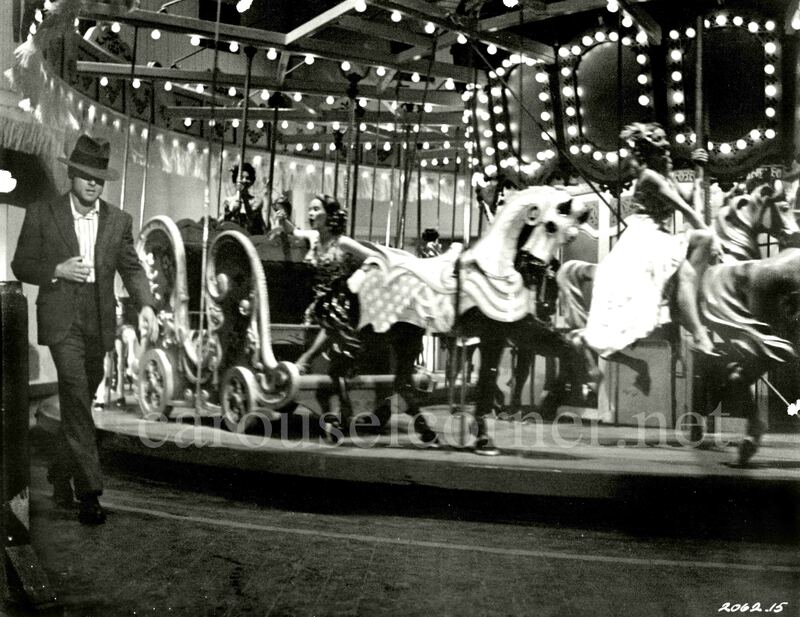 Loughton on an unknown Spillman carousel. 1936 – Poppy - Comedy, starring W.C. Fields, Rochelle Hudson, Richard Cromwell. Snake oil salesman (Fields) tries to stay ahead of the sheriff, while remaining loyal to his beloved daughter (Hudson). Right - Hudson and Cromwell on Parker an unknown Parker carousel. 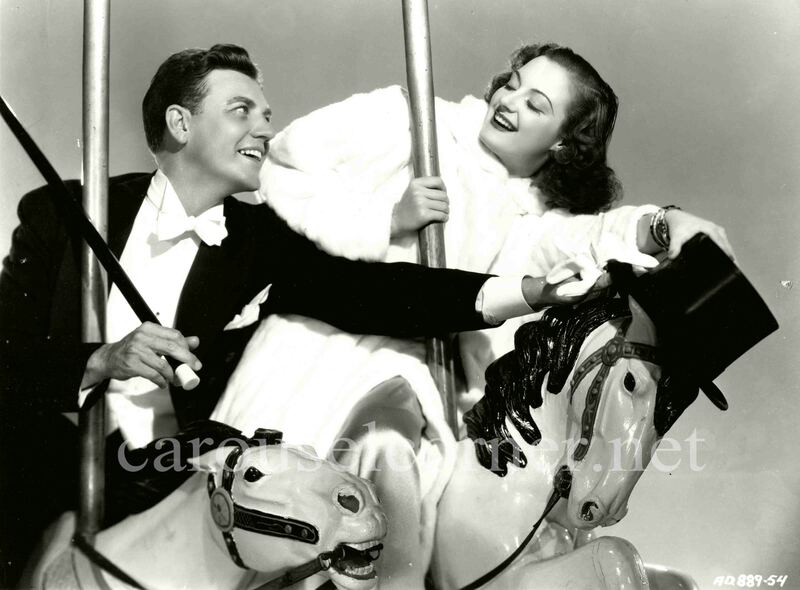 1937 – The Bride Wore Red - Comedy, Drama, Romance - starring Joan Crawford, Franchot Tone, Robert Young, Dickie Moore. club singer (Crawford) is disguised as an aristocrat’s daughter at a fancy resort hotel. She falls for the postman rather than the upper-class clientèle. 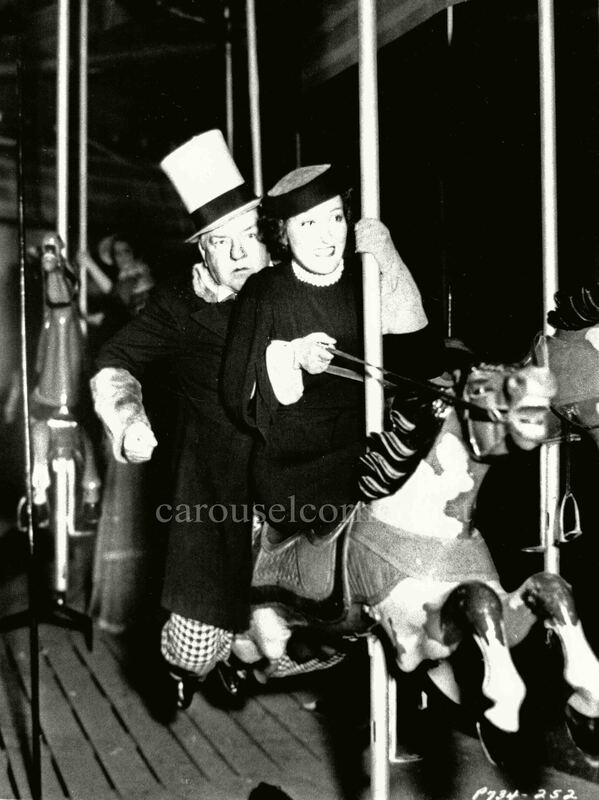 1937 – Carnival Queen - Crime, Romance - starring Dorthea Kent and Robert Wilcox. 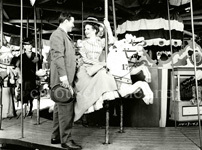 Kent is a carnival owner on the trail of crooks. Kent and director, Nate Watt, on an unknown Herschell. 1937 – Kid Galahad - Crime, Drama, Romance - starring Edward G. Robinson, Bette Davis, Humphrey Bogart, Wayne Morris. Fight promoter Robinson trains Morris (Kid Galahad), but didn’t plan on Morris falling for his sister. Possibly the New London, CT Looff carousel. 1937 – Eric Linden and Cecilia Parker only made 3 movies together this year, Girl Loves Boy, Sweetheart of the Navy and A family Affair. This still is probably from one of those films. 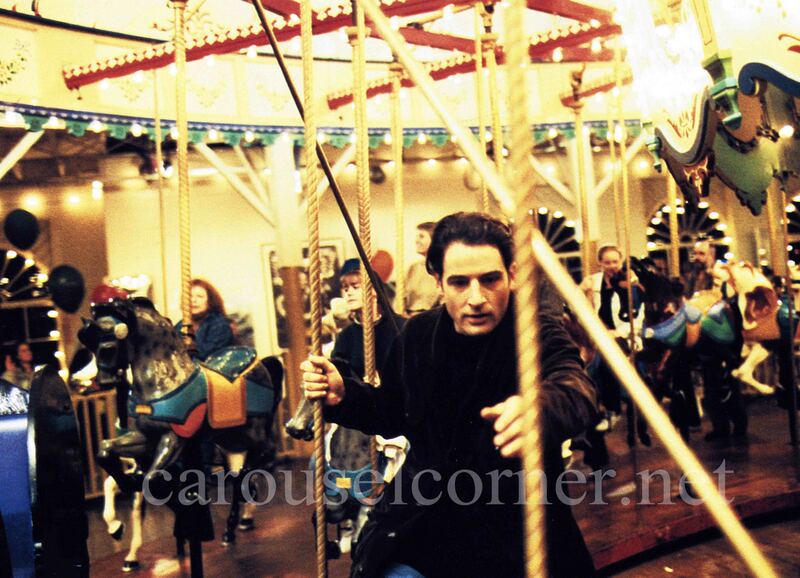 Unknown Looff carousel. 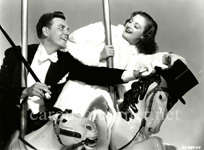 1938 – Merry Go Round of 1938 - Comedy, Musical, Romance - starring Bert Lahr, Jimmy Savo, Billy House, Joy Hodges. Vaudeville meets Hollywood for a fun romp. 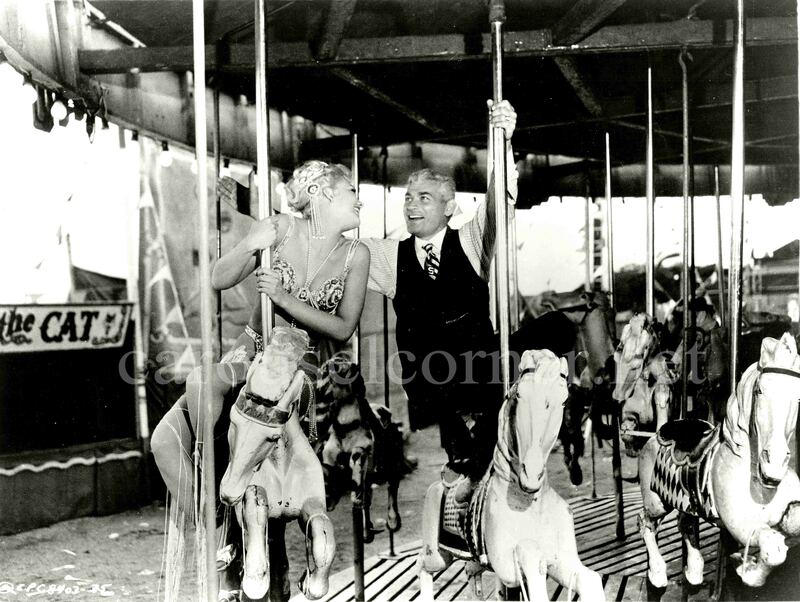 Joy Hodges and an unknown actor on Herschell horses. 1940 – Johnny Apollo - Crime, Drama, Romance - starring Tyrone Power, Dorothy Lamour, Edward Arnold, Lloyd Nolan. A son (Power) turns to crime to get his father out of jail. 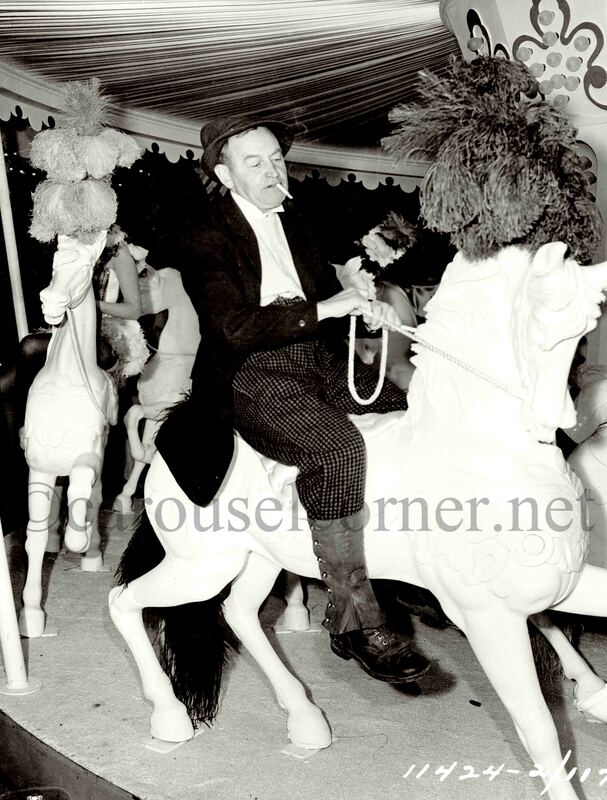 Lamour and a Dare horse. 1941 – Road Show - Comedy, Music - starring Aldophe Menjou, John Hubbard, Carole Landis, Patsy Kelly. The male lead (Hubbard) flees to an asylum, faking insanity, to escape marrying a gold digger. There he meets Menjoue, a comical character, and together they join up with a carnival that leads to slapstick adventures. 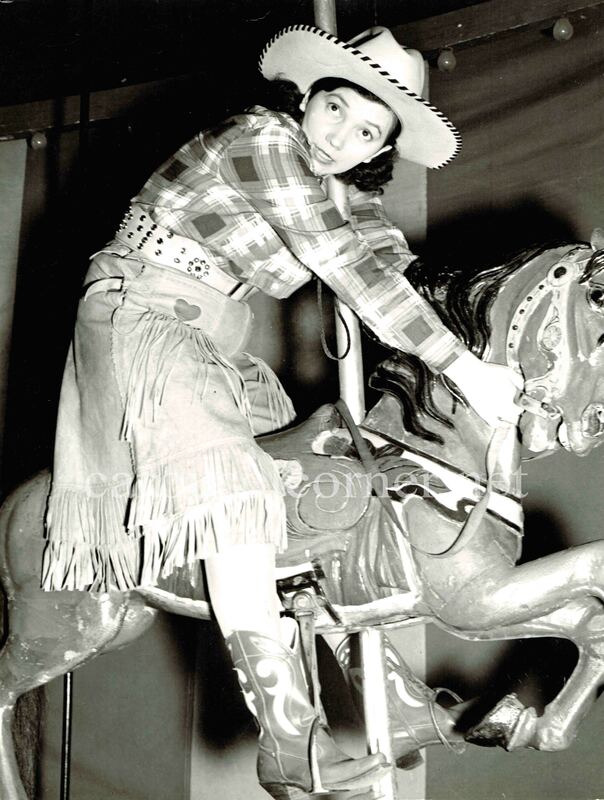 Patsy Kelly on a Herchell horse. 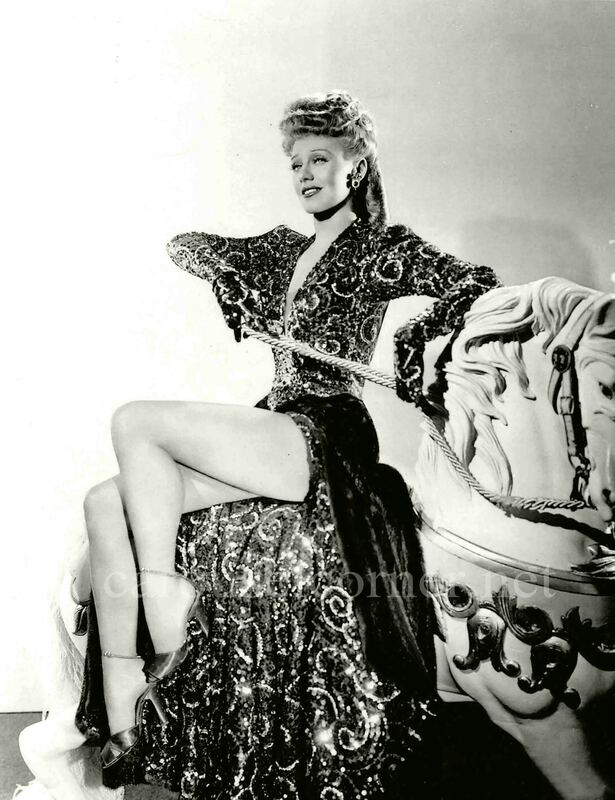 1944 – Lady in the Dark - Drama, Musical, Romance - starring Ginger Rogers, Ray Milland. An unhappy fashion magazine editor undergoes psychoanalysis and has colorful dreams. Milland and Teresa Wright on an unknown Parker. 1945 – The Stork Club (?) - Comedy, Romance, Musical - starring Barry Fitzgerald, Betty Hutton, Don DdeFore. Saved from drowning by a hat-check girl (Hutton), Fitzgerald repays her by providing a good life for her anonymously. Her boyfriend (DeFore) thinks she’s a kept woman. 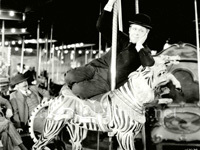 Fitzgerald on a mock-up carousel with Looff horses. 1947 – The Imperfect Lady - Drama, Romance - starring Ray Milland and Teresa Wright. Set in the 1890’s in England. Wright, in a touring dance troupe, falls for Milland who is aspiring to be in Parliament. Fearing her status will harm his future, she reconnects with a dance troupe and while in full makeup, is mistaken for a prostitute. In the end, love wins out and Milland chooses Wright over politics. 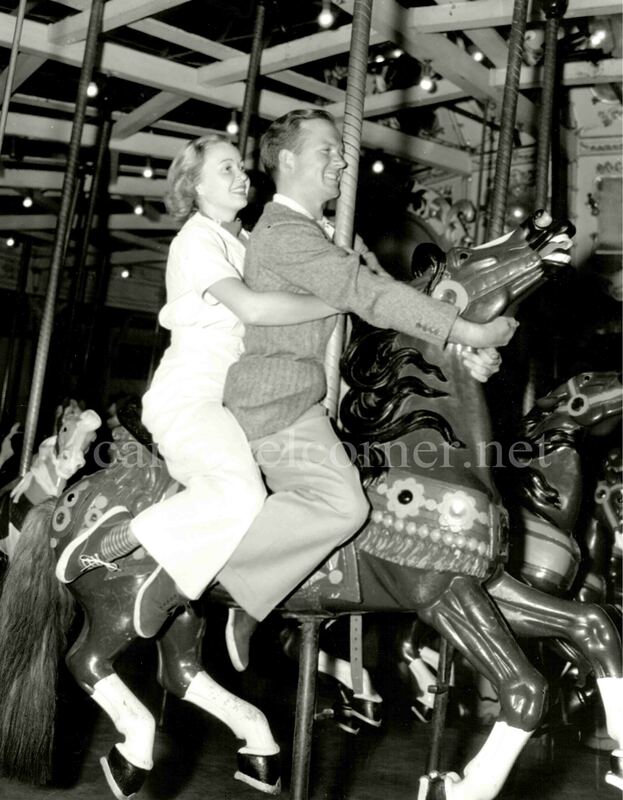 Milland and Teresa Wright on an unknown Parker. 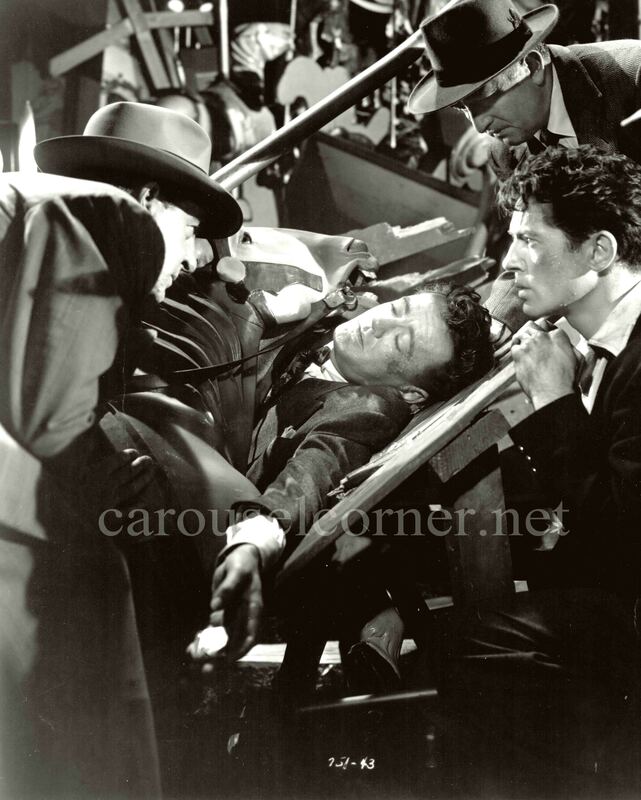 1951 – Strangers on a Train - Crime, Film-Noir, Thriller - starring Robert Walker, Farley Granger, Ruth Roman, Leo G. Carroll. Two strangers, Bruno and Guy, meet on a train where a plot is launched in which each will kill -demented Bruno (Walker) will kill Guy’s (Granger) cheating wife and Guy will kill Bruno’s hated father. 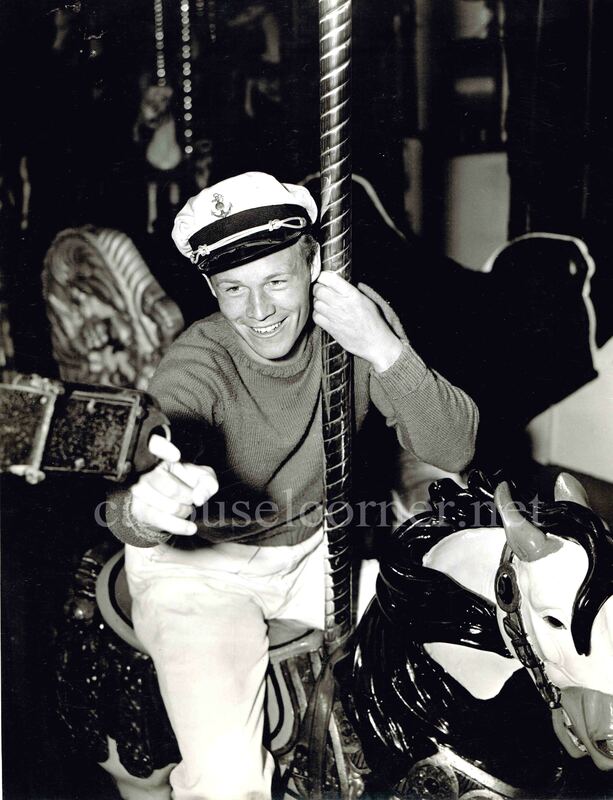 Unknown Herschell carousel with horses from the Griffith Park Spillman. 1955? 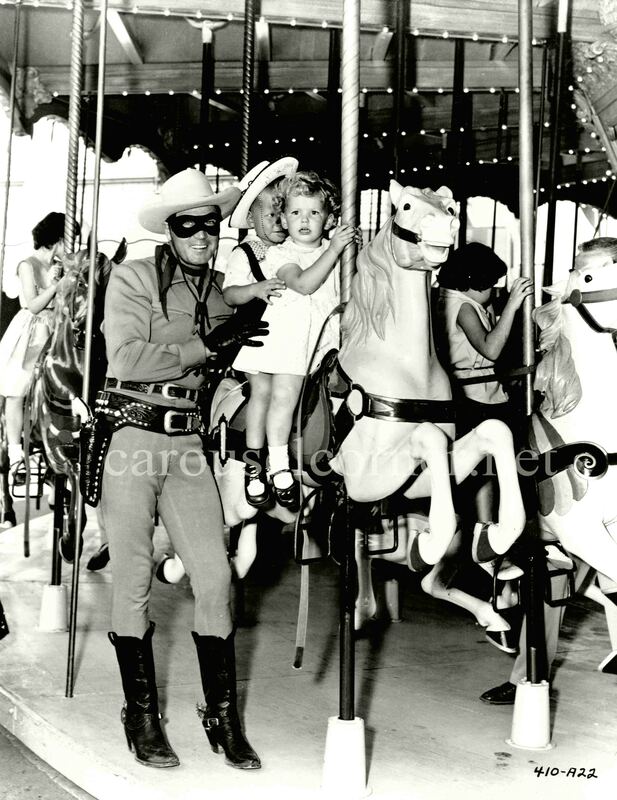 – The Lone Ranger publicity still at Disneyland, possibly for its grand opening. 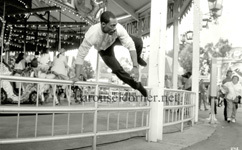 Dentzel/mix carousel. 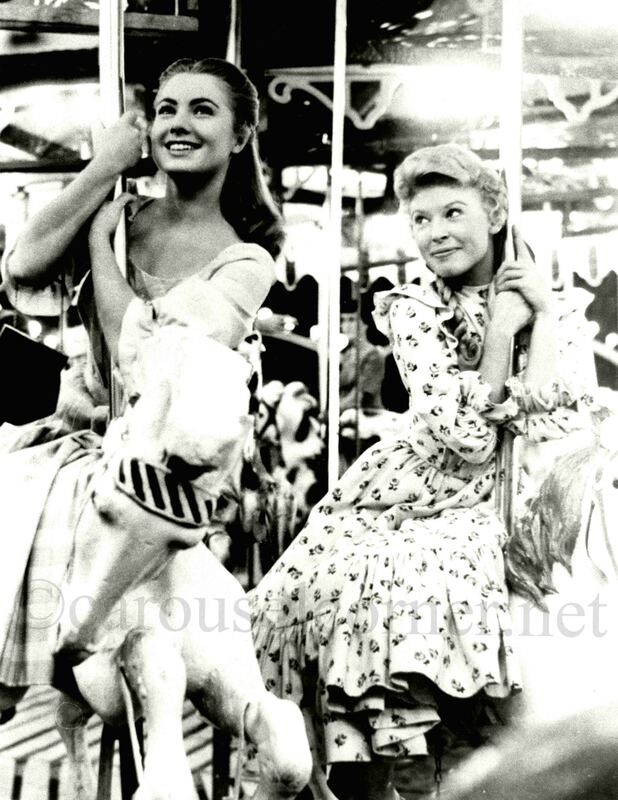 1956 – Carousel - Drama, Musical - starring Gordon MacRae, Shirley Jones, Cameron Mitchell, Barbara Ruick. 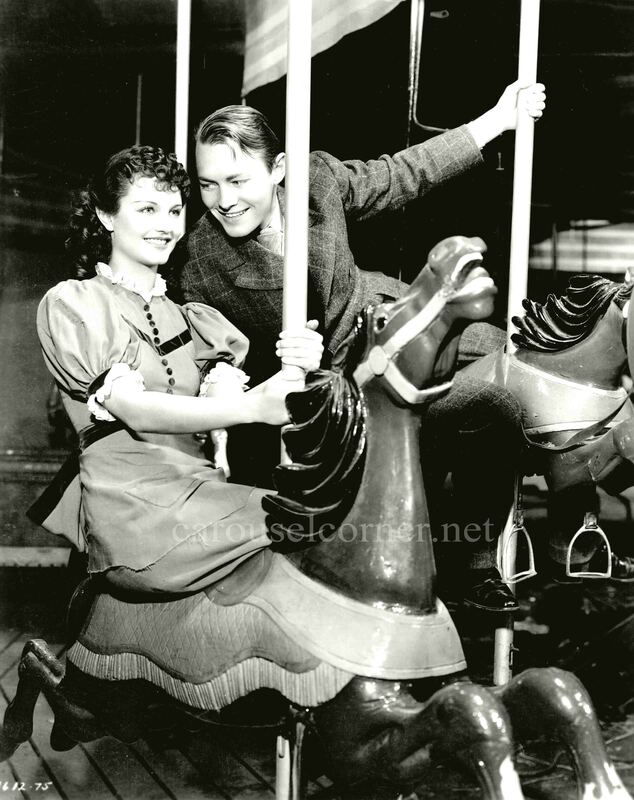 Carousel operator, Billy Bigelow (MacRae) marries Julie (Jones) but their love isn’t enough to keep him out of trouble. 1957 – Jeanne Eagles - Biography, Drama - starring Kim Novak, Jeff Chandler, Agnes Moorhead. Failed beauty queen Novak becomes a carnival dancer white aspiring to become an actress. She succeeds only to alienate her supporters which point her in a downward spiral. 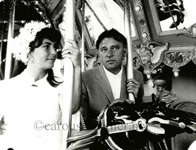 Novak and Chandler on a Herschell carnival carousel. 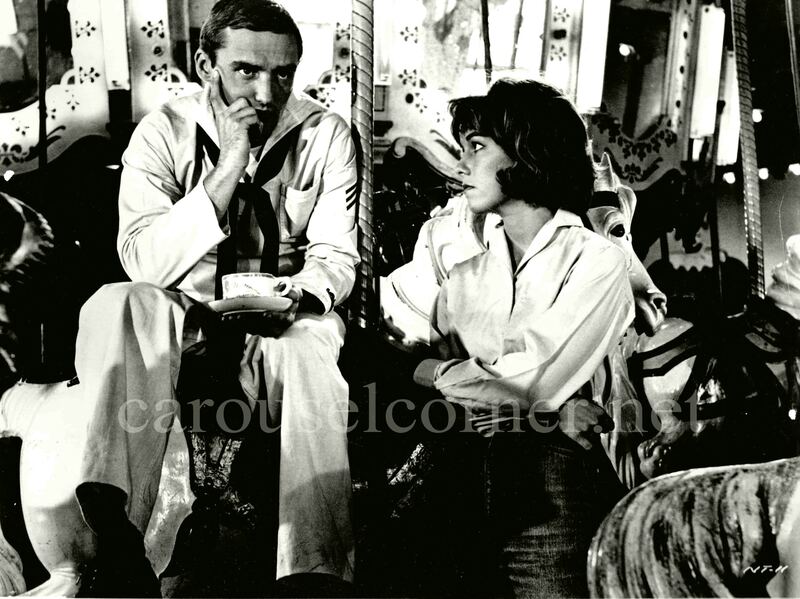 Night Tide, 1961 starring Dennis Hopper, Linda Lawson – Hopper falls for a carnival act mermaid and fears she is a real mermaid who kills during the full cycle of the moon. Philadelphia Toboggan Company #62, Santa Monica Pier, California. 1963? 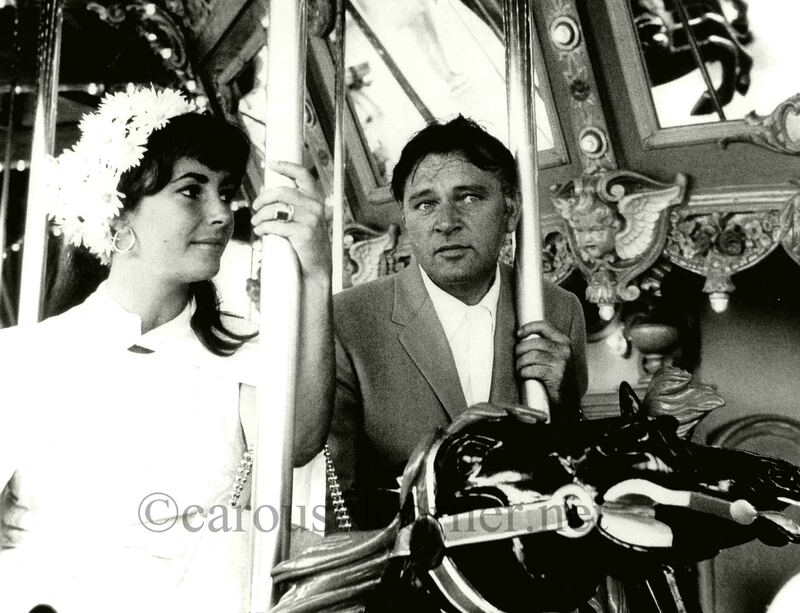 – Cleopatra - Elizabeth Taylor and Richard Burton publicity still at Disneyland possibly in conjunction with the making of Cleopatra. 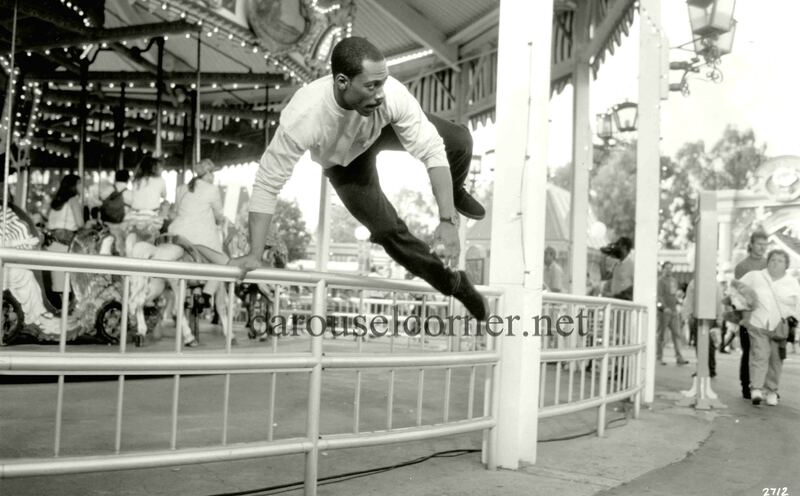 Dentzel/mix carousel. 1964 – Roustabout - Drama, Music, Musical - starring Elvis Presely, Barbara Stanwyck. A singing biker (Elvis) loses his job after a fight and joins a carnival where it’s owner (Stanwyck) helps him learn about family values. Elvis and Stanwyck on an unknown Herschell carousel. 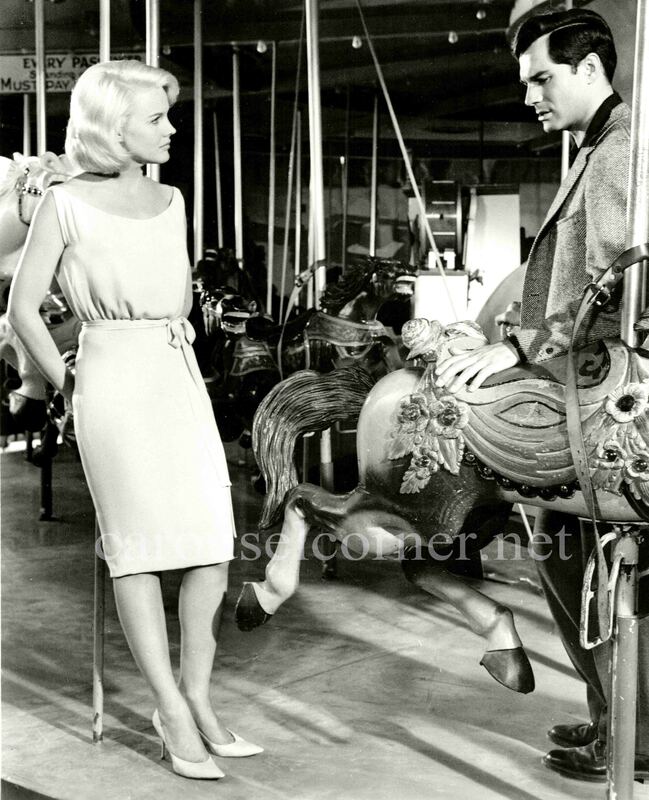 1965 – Sylvia - Drama - starring George Maharis, Carroll Baker, Joanne Dru, Peter Lawford, Aldo Ray. Sylvia’s wealthy betrothed does a background check and discovers she has a sordid background. The PI hired to uncover her past (Maharis) falls for Sylvia (Baker) so he does not disclose his findings. Maharis and Baker on the Beverly Park Parker. 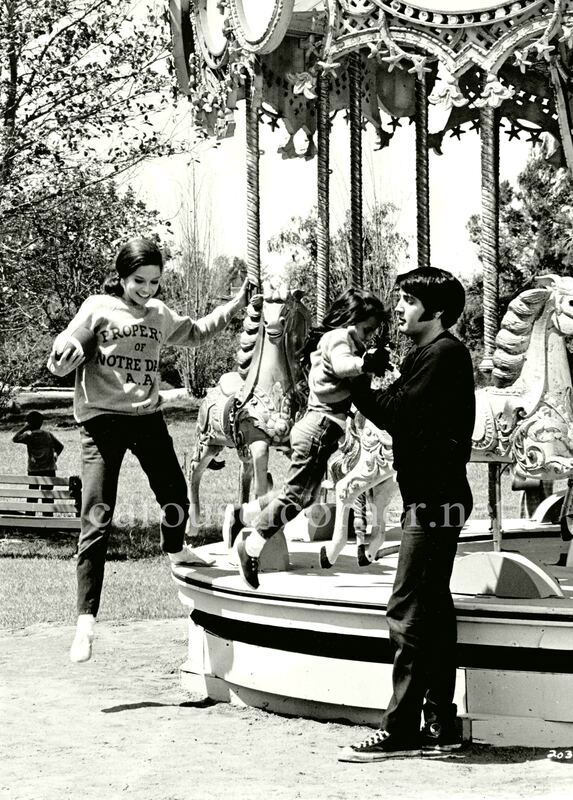 1969 – Change of Habit - Crime, Drama, Music - starring Elvis Presely, Mary Tyler Moore, Barbara MC Nair. Preparing to be a nun, Moore goes incognito into a tough neighborhood to make improvements to prove she is ready to make the commitment. She didn’t plan on falling for a young doctor (Elvis) and has to make a choice between him and her original plan. 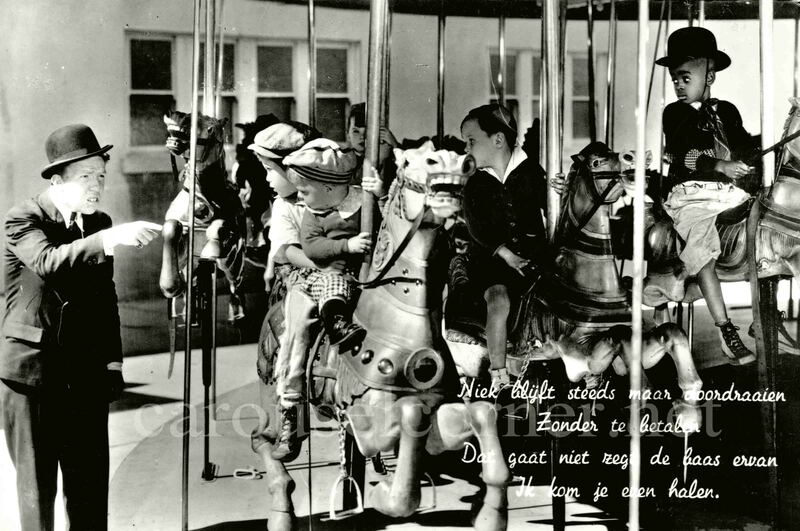 A mock-up carousel with Spillman-type horses with added decorations. 1972 – Up the Sandbox - Comedy -starring Barbra Streisand, David Selby. 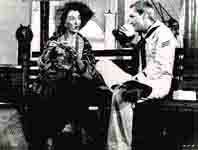 A neglected wife and bored mother (Streisand) conjures up elaborate fantasies. 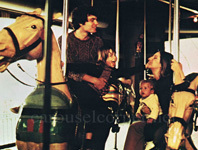 Streisand and Selby on the Central Park Stein & Goldstein carousel. 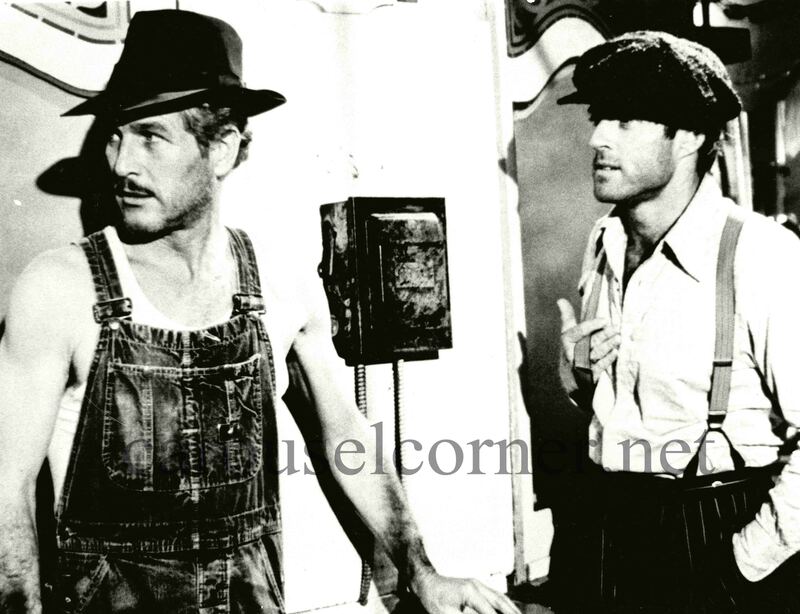 1973 - The Sting – starring Paul Newman, Robert Redford, Robert Shaw – Two professional grifters set out to con a mob boss in Chicago in 1936. Philadelphia Toboggan Company #62, Santa Monica Pier, California. 1980 - Blood Beach - starring John Saxon, Marianna Hall, Burt Young – Something under the sand is causing people to disappear. Philadelphia Toboggan Company #62, Santa Monica Pier, California. 1983 – Americana - Drama - starring David Carradine, Barbara Hershey. 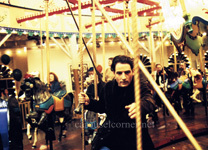 A troubled war vet works to restore an old carousel while he tries to rebuild himself. Carradine on an unknown Herschell carousel. 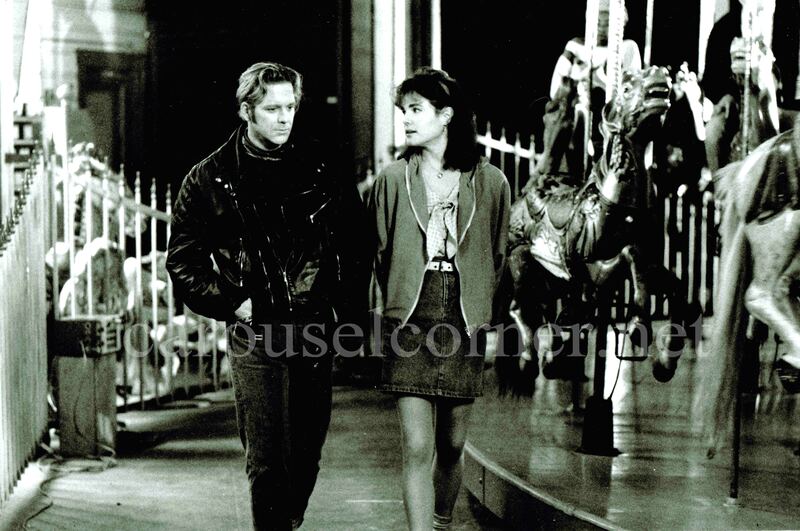 1989 – Johnny Handsome - Crime, Drama, Thriller - starring Mickey Rourke, Elizabeth McGovern. Given a new face to replace a deformed one and paroled from jail, thanks to a kindly doctor, Rourke, a career criminal, still seeks revenge against the person who sent him to jail. 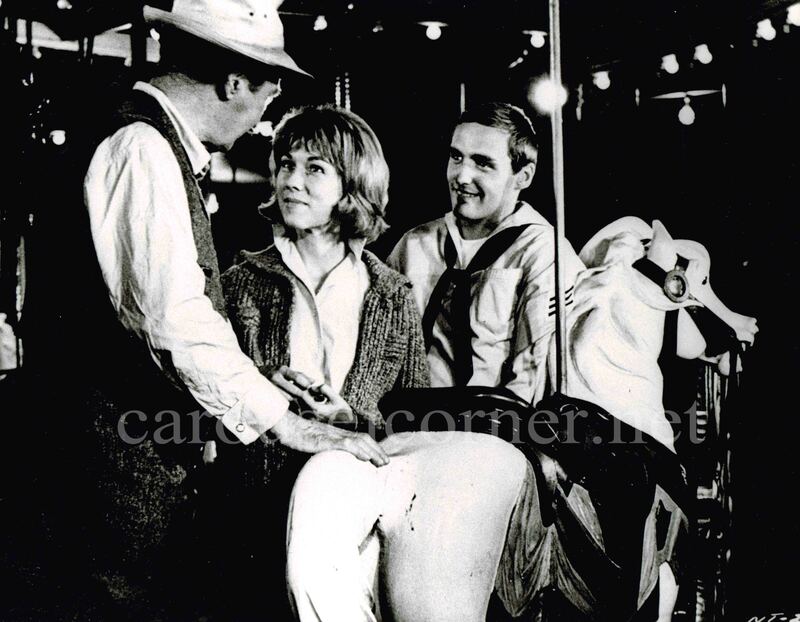 Rourke and McGovern at the Griffith park Spillman carousel. 1992 – Buffy the Vampire Slayer - Action, Comedy, Fantasy - starring Kristy Swanson, Donald Sutherland, Paul Reubens aka Pee Wee Herman. Teenage Swanson and her adventures as a vampire slayer. 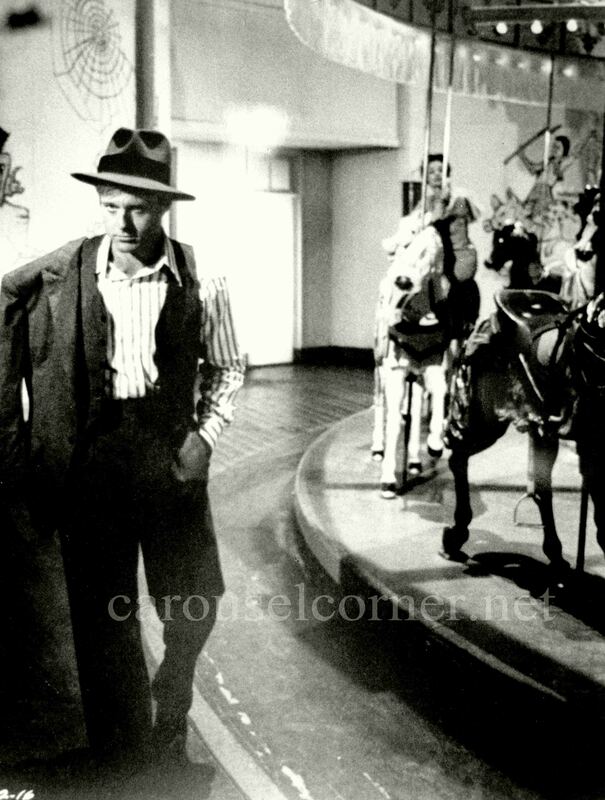 Reubens at the Griffith Park Spillman carousel. 1994 – Beverly Hills Cop III - Action, Comedy, Crime – starring Eddie Murphy. Murphy stumbles upon a counterfeit money ring in a Los Angeles theme park - actually Paramount’s Great America Park in Santa Clara, CA. Murphy and Philadelphia Toboggan Company #45. 1995 – The Net – Action, Crime, Drama – starring Sandra Bullock. Cyber thriller in which Bullock falls victim to a conspiracy which leads to elimination of her identity and ultimately exposing the crimes. 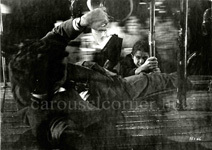 A chase scene on Philadelphia Toboggan Company #62, Santa Monica Pier, California.